Dysrhythmia - body, last, causes, What Is Dysrhythmia? Dysrhythmia (dis-RITH-mee-a), or arrhythmia (a-RITH-mee-a), is a change in the regular beat of the heart. The heart may seem to skip a beat, beat irregularly, or beat very rapidly or very slowly. Annie, who had just turned 15, was running for student council treasurer. On the morning of her campaign speech before the entire student assembly, her heart began to race in her chest. Stepping behind the podium in the auditorium, she felt a little dizzy and out of breath. During the first few minutes of her speech, she worried that she might faint, but as she kept speaking and gained confidence, the sensations vanished and her heartbeat slowed down. By the time she reached her last sentence, everything was back to normal. Dysrhythmia is any variation in the regular beat of the heart. Some of these changes are normal—like Annie's palpitations * —while others are more serious. People's hearts naturally speed up with emotion or exercise and slow down during sleep. Other dysrhythmias are associated with heart disease and can be life threatening. The human heart is a muscular pump divided into four chambers—two atria located on the top, and two ventricles located on the bottom. But it is more than a pump; it is also an amazing piece of electrical machinery that, when healthy, keeps these chambers beating in an organized manner. * palpitation is the sensation of a rapid or irregular heartbeat. 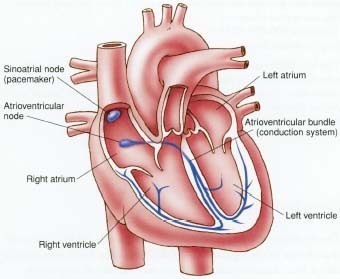 The sinoatrial node is the heart's pacemaker. the ventricles that conducts the electrical signal and sends the impulse to all parts of the ventricles. This exact route must be followed to ensure that the heart pumps properly. As the electrical impulse crosses through the heart, the heart contracts. This normally occurs about 60 to 100 times per minute, with each contraction equaling a single heartbeat. The atria contract about one-fifth of a second before the ventricles, allowing them to empty their blood into the ventricles before the ventricles contract. External and internal forces can cause dysrhythmia. External factors include exhaustion, overexertion, emotional stress (such as Annie's campaign speech), cigarette smoking, drinking alcohol, and ingesting stimulants such as caffeine, decongestants, and cocaine. Internal factors include heart defects present at birth, thyroid problems, inflammatory diseases, and problems in the autonomic nervous system, which carries nerve impulses from the brain and spinal cord to the heart. The most important factor that contributes to serious dysrhythmias, however, is heart disease, including coronary artery disease, abnormal heart valves, and congenital heart disease. Bradycardia (bray-dee-KAR-dee-a), a heart rate of fewer than 60 beats per minute in an adult. Tachycardia (tak-i-KAR-dee-a), a heart rate of more than 100 beats a minute in an adult. Sick sinus syndrome, in which the heart rate slows down or varies between slow and fast rates. Atrial flutter, a very fast (250 to 350 beats per minute) but steady heartbeat. Atrial fibrillation (AY-tree-al fib-ri-LAY-shun), in which the atria quiver instead of beating effectively. This is a major cause of stroke. Ventricular tachycardia, rapid heartbeat (> 150 beats per minute) that can lead to ventricular fibrillation. Ventricular fibrillation (ven-TRIK-yoo-lar fib-ri-LAY-shun), in which the ventricles quiver instead of beating, and the heart cannot pump any blood. Without emergency treatment, the person will die within minutes. Premature ventricular contractions, extra heartbeats that are often felt as "missed beats" or "flipflops" in the chest. Symptoms of dysrhythmias can vary from none to fatigue, lightheadedness, dizziness, palpitations, fainting, or shortness of breath, to sudden collapse and death. Although many dysrhythmias are harmless, a doctor should check them because they can signal heart disease or other conditions that need treatment. Like fingerprints found at a crime scene, electrocardiogram * (ECG or EKG) tracings are important pieces of physical evidence that track irregularities in the heartbeat. Sometimes, however, an abnormal heartbeat does not show up during a visit to the doctor. In that case, a 24 hour Holter ECG monitor can be worn to track the heartbeat. A stress test, in which the patient walks on a treadmill while being monitored, can help a physician see the effect of exercise on the heart. Normally, people's heart rates vary a bit—even from one beat to the next. Many dysrhythmias—such as Annie's—require no treatment at all. Some abnormal rhythms may need to be controlled with medication or, on occasion, electric shock. Dysrhythmia can also be treated with the implantation of a battery-powered pacemaker that sends small electrical charges through an electrode placed next to the wall of the heart. A cardioverter/defibrillator, a sophisticated device that actually senses an abnormal rhythm and delivers one or more lifesaving jolts of energy to shock the heart back to normal rhythm, can replace a defective natural pacemaker or a blocked pathway. Catheter ablation is a surgical technique that uses a tiny device at the end of a catheter (a flexible tube) inserted into the heart to burn away the part of the heart causing the abnormal rhythm. * electrocardiogram Electrodes attached to the skin detect the electrical impulses as they travel over various parts of the heart. An abnormal ECG can alert the doctor to trouble in a particular area or function of the heart. If heart disease is not the culprit, the doctor may suggest that the patient not drink coffee, tea, colas (which contain the stimulant caffeine), or alcoholic beverages. Over the long term, it is important to eat a balanced, low-fat diet and get regular exercise to keep the heart healthy.